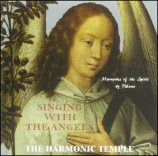 ‘The Harmonic Temple’ is a collection of chants in four part harmony using short texts from a broad spectrum of spiritual traditions. When sung repeatedly in an open-hearted manner, a special ambience develops; a feeling of being in a Sacred space created by the sound of the harmony, which for want of a better expression, I call 'the Harmonic Temple'. Having a particular, or any religious belief is not necessary to engage with and benefit from singing Harmonic Temple songs. Ultimately what works or doesn't is the experience of the music itself and the singing of it, which is a direct experience independent of any belief system. Open-mindedness however, is a requirement in dealing with the diversity of text sources, as fundamentalists of any tradition will have difficulty embracing the wisdom of others. My selection of texts is very personal, as I will only work with phrases that have juice for me on some level, and I hope I can communicate enough of that to give some kind of handle on it to those for whom it might otherwise seem alien. 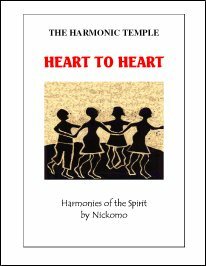 The Harmonic Temple happens when a group of singers sing in a circle, for themselves and each other with no other audience, with the intent of going deeply into the attunement of the chant. This usually means sustaining the song for a while, so that all the singers can get past the point of struggling to remember words or melody, and beyond issues around vocal inadequacy, to the point at which they are one with the music and its intent. This can include exploring the physical space occupied by the singers, to feel the impact of the sound from various places in and around the circle, and times of listening, prayer, meditation and/or allowing the music to enter as a medium of healing. Click for intro. to 'Heart to Heart' book. I experience music as a magical transformative medium, especially singing, which involves the being in a complete and individual way. Through music has come most of my understanding of mystical concepts, such as the transcending of self to feeling a sense of oneness with a greater universal reality. I have experienced it as a great healing, and as a profound meditation, and as the best way for me of addressing the Great Mystery in prayer. Unaccompanied vocal harmony has the most potent magic for me, I regard it as a great gift and as sacred as anything I understand by that word. My aim in creating Harmonic Temple pieces is to find a musical vehicle that delivers the intended focus in a way that feels right and available to every singer, undistracted by unnecessary difficulties.